Turkey’s prime minister on Saturday underlined Ankara’s rejection of a French offer to mediate between Turkey and terrorist groups in Syria. Speaking at a hospital opening in the Aegean Izmir province, Binali Yildirim said of French President Emmanuel Macron, who proposed the mediation: "Who gave you this authority, who gave you this mission?" If France's president wants to referee between terror groups he can do this, but not with Turkey, said Yildirim. He added: "Turkey doesn’t negotiate with terrorists, doesn’t shake hands, but roots them out," he said. Meeting with a terrorist PYD/PKK-led SDF delegation on Thursday at the Elysee Palace, Macron claimed "a dialogue could be established between the SDF and Turkey with the assistance of France and the international community." He further claimed that the SDF had “no operational link with this terrorist group,” meaning the PKK. In its 30-year terrorist campaign against Turkey, the PKK has taken some 40,000 lives. Ankara has warned against international actors cooperating with such groups as the PYD/PKK, YPG/PKK, and SDF/PKK, as they are just the PKK under different names. In its ongoing Operation Olive Branch, Turkey has targeted PYD/PKK and Daesh terrorists in Afrin, Syria, just across Turkey's southern border. Turning to health care, Yildirim also said that starting next year Turkey will begin producing vaccines for diseases like tetanus and diphtheria. "Our steps in the medical sector will save us 6 billion liras [$1.5 billion]," he added. Yildirim said as part of their localization project, they will produce 80 percent of the medicines consumed in Turkey. He said that in the last 15 years, under the ruling Justice and Development (AK) Party, they increased the bed capacity of healthcare facilities from 18,000 to 108,000 and boosted the numbers of emergency care facilities. 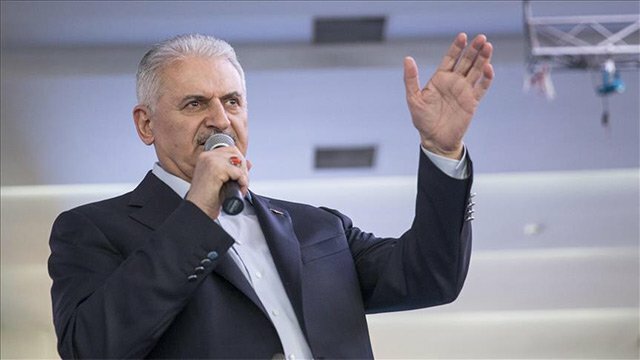 Later, speaking at the ruling Justice and Development (AK) Party’s congress in the Aegean province of Izmir, Yildirim said Turkey’s development in every area has disturbed some circles both inside and outside the country. “They try to put obstacles in front of Turkey with lies, but the peace operation that we started with Operation Euphrates Shield continues successfully with Operation Olive Branch,” he said, citing Turkey’s operations meant to clear terrorists from areas of Syria bordering Turkey. Operation Euphrates Shield launched in September 2016 and concluded in March 2017, while Operation Olive Branch began on Jan. 20 in Syria’s northwestern Afrin region and is still ongoing. Yildirim noted how some Western countries spoke out against both operations. Touching on the Syrian refugee issue, he said that while Europe forgot the deals it made regarding the war-weary refugees, Turkey fulfilled all of its responsibilities. “They failed to discharge their responsibilities they pledged for our Syrian brothers living in Turkey,” Yildirim said. In March 2016, the EU and Turkey reached an agreement to take stricter measures against human smugglers and discourage irregular migration through the Aegean Sea, and improve the conditions of Syrian refugees in Turkey. The EU has failed to deliver the promised €3 billion ($3.7 billion) funding for refugees in Turkey in a timely manner. Turkey, the largest refugee-hosting country in the world, hosts more than 3.5 million Syrian refugees. Syria has been locked in a devastating civil war since early 2011 when the Bashar al-Assad regime cracked down on demonstrators with unexpected ferocity.